Found 26 file extension associations related to iPhoto and 18 file formats developed specifically for use with iPhoto. 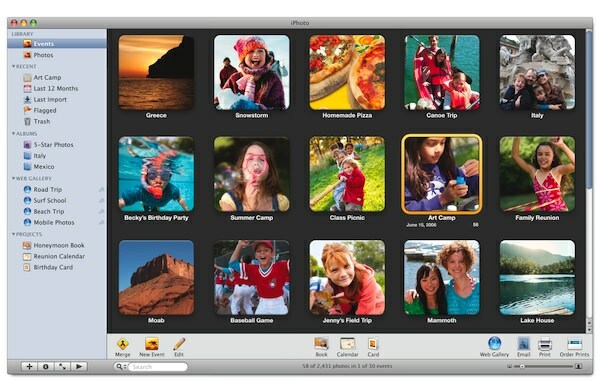 iPhoto makes managing your photos as easy as taking them. It helps you organize your photos so you can find them fast. Edit them so they look their best. And share them with your friends and family. Organize - keep track of your photos by who, where, and when. Improve - get rid of red-eye, crop, retouch, make colors pop. Enjoy - watch a slideshow on your Mac, iPod, or iPhone. Share Online - publish your photos to Facebook, Flickr, and MobileMe. Share in Print - design custom photo books, cards, and calendars. If you need more information please contact the developers of iPhoto (Apple, Inc.), or check out their product website.